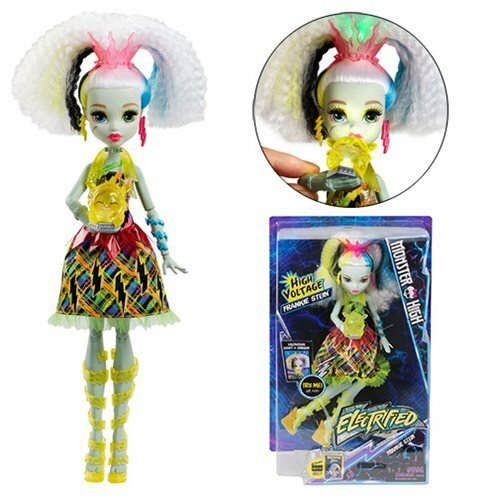 Amp up the fun with the Monster High Electrified High Voltage Frankie Doll. She and Znap, her beastie from the movie, interact with lights and sounds! Easy child-activated movement starts one of four different responses. To recreate a key scene from the movie for a wow moment, simply lift the arm in which Frankie Stein holds Znap to bring the two together and spark the daughter of Frankenstein's electrifying powers! The reaction ranges from an electric kiss and a colored light to an electrifying sizzle and multicolored light show. Frankie's crimped ponytail and her adorable beastie both light up. Doll cannot stand alone. Colors and decorations may vary. Requires 3x "AG13" batteries, included. Ages 6 and up. Frankie Stein is stunning in a dress with a neon multicolored print inspired by lightning bolts, a green hem trim, and vinyl pink peplum. Neon jelly accessories, including electrified yellow wrap sandals, colorful lightning bolt earrings, and a blue bangle are voltageous. Recreate the big moment from the movie or spark your imagination with adventures of your own, and collect all the Monster High Electrified dolls for even more energetic play (each sold separately)!